Vancouver is ripe with locations to take engagement photos and other pre-wedding photo sessions and one of our favourite places to take pictures is Granville Island. A shopping district known for it's public market, thriving artist community and many breweries, such as the Granville Island Brewing Company, this little city within a city boasts one of Vancouver's best properties. This island in False Creek accessed by the Granville Street Bridge gives the feeling of a quaint small town the moment you drive into the parking area and the feeling this gives to brides and grooms ready to have their pictures taken is one of serenity and calm. This is a perfect recipe for romance. Of course you can host a wedding on the island at the Granville Island Hotel, or at Performance Works, for our purposes we went dockside for some high fashion styled photos with the Vancouver skyline on the other side of the water with the Marina in view. Because of it's proximity to all the high rise residential apartments in the area it gives very interesting backgrounds for our subjects. 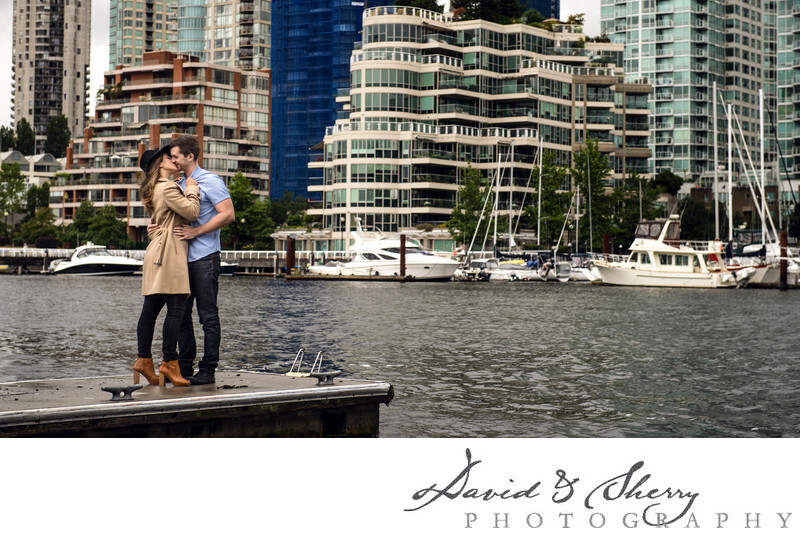 We love taking engagement photos on Granville Island and look forward to the next time we take a couple there. Granville Island is located in Vancouver, B.C. Location: 1669 Johnston St, Vancouver, BC V6H 3R9.